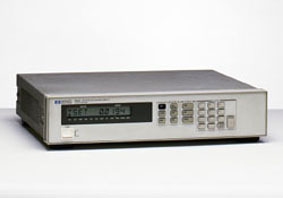 The Agilent 6632A programmable DC Power Supply is a single output 100 Watt workhorse well known for its reliability and having minimum downtimes. It combines extensive programming capabilities with solid power supply performance, which makes them an excellent choice when using for multiple power supply applications. Many users have operated these power supplies extensively in their facilities for years and report smooth operation and great up times, making them hugely popular and constantly in demand. The Agilent 663X – series models offer solid 100 Watt power with the 6632A with rating range to 20 Volts @ ±5 A. The current and voltage output is programmable for both CV and CC operations with high precision. An included DCM and precise current shunt both measure the true 6332A output. The single range power supply is performs admirably when called on for either sinking or sourcing current. Options that we see demand for include multi programmable output that is available by way of the front panel or by remotely using the HP-IB. When using the software calibration, it is not necessary to remove the supply from the system cabinet, a real time saving feature. The internal interface of the HP-IB gives the user complete programming capability that includes status reports and also interrupt generation that allows user defined fault conditions. With the Agilent 6632A, the technician is able to self test at power up or from a specific command and can easily choose from normal or fast operation modes at the rear panel switch. In the fast mode, the output capacitors are disconnected which speeds up the output response times dramatically means expanded productivity. Additionally, normal mode is specifically optimized for PARD. Testing of mobile and digital cellular phones is a simple matter for the Agilent 6632A user with its voltage and current waveform analysis. Extensive measurements can be made to determine battery operation times of wireless digital electronic equipment and are viewable with the easy to read bright front panel display. The superlative load and line regulation and low ripple and noise are also noted by users. Output connections are conveniently positioned on the rear screw terminals. You are able to ground both the negative and positive output terminals, or with chassis ground the user can float the output up to +/-240 Volts DC. The supply can also be jumpered for local sensing. Having the complete feature set of the Agilent 6632A affords the user serious cost savings and performance in one reliable, field proven model. This entry was posted in Site News and tagged Agilent 6632A. Bookmark the permalink.